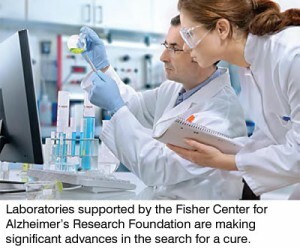 At the Fisher Center for Alzheimer’s Research Foundation, we are funding innovative Alzheimer’s research that is beginning to make serious headway. I wanted to talk to you not as a scientist, but as a regular guy originally from the Midwest, trying to help make sense of the new initiatives aimed at developing new Alzheimer’s treatments, taking place in the Fisher Center for Alzheimer’s Research laboratory. Alzheimer’s is a progressive disease that destroys large areas of the brain over time, leaving its victims with little comprehension or awareness. Research indicates that the disease is associated with abnormal accumulations of proteins in the brain called plaques and tangles. A majority of scientists involved in Alzheimer’s research believe that abnormal accumulation of beta-amyloid is the main factor responsible for the degenerative changes that occur in the brain as the disease runs its course. Thus, drugs that lower beta-amyloid levels in the brain are expected to offer the most promising treatments. The lab we primarily fund is under the direction of Nobel laureate Dr. Paul Greengard. The Greengard lab team believes they can decode the mystery of Alzheimer’s by identifying a protein that can stop the unnatural buildup of beta-amyloid. Their plan is to isolate those cells that are resistant to beta-amyloid plaque and bring them into the lab, where they can find out why they are resistant and look for more effective treatments for people with Alzheimer’s. Previously, looking at the nature of cells required examining them one at a time. But the scientists at our lab recently developed a new tool called TRAP (translating ribosome affinity purification), which allows them to see the nature of many cells at once. Using TRAP, they are now able to analyze the subtle differences between cells that they couldn’t detect before to see which cells are more resistant to beta-amyloid plaque, and how they work in groups. This new information should point scientists in the direction of a protein that can help cells resist beta-amyloid plaques. Once that is located—and they are close to finding it now—they will be able to provide the fundamental information needed for drug companies to produce and develop effective Alzheimer’s treatments. This process offers the possibility of cutting a significant amount of time from the search for a cure. Along with our lab’s promising new discoveries, we are working to make sure our educational and awareness resources are the best we can offer. It is my greatest desire to offer a real sense of hope and show you how far we’ve come in our search for effective treatments and a cure. 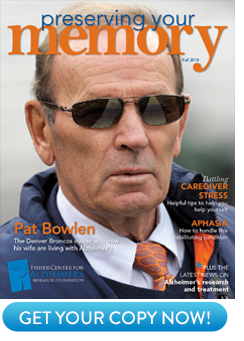 In fact, you can visit our website, www.ALZinfo.org, to read The Expert Review, where we publish scientifically reviewed Alzheimer’s news. There you can also learn about the stages of the disease and appropriate care, access our Facebook: Alzheimer’s and Dementia Support Group, and ask us any question you want through our Ask The Experts section. No question is too big or too small.